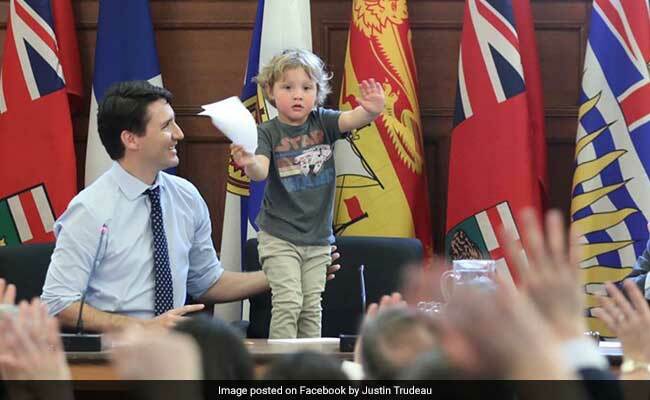 New Delhi: Looks like it was - bring your kids to work day at the Canadian Parliament as Prime Minister Justin Trudeau brought his youngest one to work on Wednesday. 3-year-old Hadrien accompanied his daddy and internet's favourite Justin Trudeau to his office and spent a day knowing all about his father's job. From playing hide-and-seek inside his father's office to sitting in his chair, Hadrien Trudeau did it all. He even addressed the press, with so much poise. The photos are just aww-some. After Justin Trudeau shared the adorable photos on social media, internet couldn't cope with the cuteness. Almost everyone agreed, Hadrien was quite a natural. Future PM, maybe? "Well he looks very at home in the Prime Ministers chair.. hmm.. give it 30 years or so and he just might be there as PM," wrote Wendy Jones-Prouse on Facebook. "I see a future Prime Minister of Canada, a little serious, but such lovely hair! And he can play peek-a-boo and out-run the current PM. Pull your socks up, sir! You have serious competition," wrote Kamla Ramalingam. "I look at this little guy and wonder if in 30 years we'll see him as a grown man sitting in that same chair as his Daddy and Grandpa," wrote Linda Lavender. Little Hadrien showed no interest as his dad gave press interviews. And while his father was giving the interview, the 3-year-old disappeared briefly. He was found in the coat closet before dad Justin Trudeau took him inside parliament to meet his colleagues. Justin Trudeau is a father of three children - 9-year-old Xavier and 8-year-old Ella-Grace and now everybody's beloved Hadrien. He has been married for 12 years to Sophie Gregoire.